In 1996 I travelled to Amsterdam to meet with Wim Crouwel the designer of the radical 1960s typeface New Alphabetí. I can‘t remember the actual reason I visited Crouwel, I had never met him before. I think partly it was to ask him if he would give a lecture to the Society of Typographic Designers (now ISTD), which he readily agreed to. It was an opportunity to ask him about his typefaces designed while he was a partner in Total Design. I was especially interested in his New Alphabet. I was amazed and delighted to learn that none of this work was available digitally. I suggested that The Foundry could digitize them and market them. Crouwel happily agreed and along with the three New Alphabet weights there were alphabets for the Fodor Museum, (part of the Stedelijk Museum, Amsterdam), and for the Vormgevers exhibition at the Stedelijk Museum, and an alphabet originally designed for Olivetti. We thought that Crouwel’s typeface work was of major importance. New Alphabet had great significance at the time when computer technology was in its infancy. 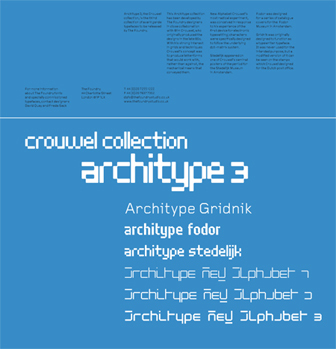 Crouwel tried to define a new vision of how new technology could be used. His New Alphabet was a revolutionary concept in designing new forms that fitted perfectly to the computer, which at the time gave fairly crude resolution. The Foundry released all six alphabets as Architype 3, part of the Architype series in 1997. One of these named Gridnik was picked up by a few designers and we were asked us if there were any more weights. This led to the development of Foundry Gridnik 4 weight typeface family, which became am instant hit.